Although SAAM claims that the chef and his local team, Aitor Zabala, Holly Jivin and Kriss Harvey, have created a 16-course menu, there are actually 23 different dishes or bites that come to the table for a price of $350 (with wine pairings available). In some dishes, the white truffles, which are from the wooded hills of Abruzzo, are already incorporated; for others — and that is when things get exciting — your server will put on the de rigueur white glove and shave the truffle so you can enjoy watching the flakes lightly twirl and fall over the potatoes, the sea urchin or the Wagyu beef, and even the passion fruit and banana sorbet. 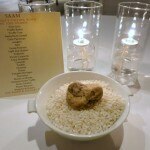 Since there are so many dishes all designed around white truffles, I can’t help but compare them to each other. Some are more delicate like the porcini carpaccio, the sea urchin served with dashi gelée, the tilefish cooked sous vide or the A4 Wagyu. Some are creative such the drop of truffle butter hidden in the stem of a nasturtium, the absolutely delicious young potatoes you have to grab with a rosemary stick, or the cavatelli (rendered black with cocoa) topped by an Iberico ham chip on which an Iberico ham broth is poured. A tad over the top is the “Nori,” a chip made of nori powder dotted with truffle purée and served on a cactus leaf, which must be eaten with your fingers. I might also recommend that the chefs put less crème Chantilly in the pumpkin meringue. 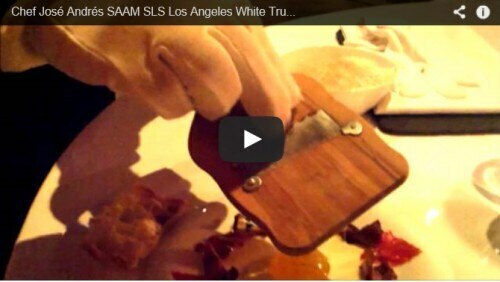 There are many intriguing dishes, so if you cannot get to SAAM, discover the full menu with explanations in my exclusive video interview above. Available on Thursday, Friday and Saturday evenings, from October 23rd through November 22nd, the evening is priced at $350 per guest with wine pairing options available for both $100 and $300 (prices exclude tax and gratuity). Reservations are required and can be made by calling 310-773-5460.